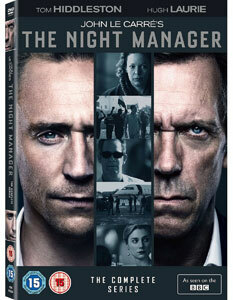 John le Carré’s 1993 espionage thriller novel The Night Manager was brought to the small screen in early 2016 with a high-budget, all-star production that won immediate plaudits. Tom Hiddleston plays Jonathan Pine, a former British soldier who now works as a night manager in a plush hotel in Cairo. Into his orderly life comes Sophie (Aure Atika), the mistress of an arms dealer who is working with Richard Roper (Hugh Laurie) – an alleged millionaire humanitarian who is in reality a dangerous and high-profile British arms dealer. When Pine passes copies of incriminating documents to a friend in MI6, word leaks out to Roper, and Pine is unable to prevent violent repercussions against Sophie. Hell-bent on revenge, Pine infiltrates Roper’s operation with the intention of bringing him down from within. For The Night Manager miniseries, le Carré’s novel has been brought up-to-date, and it opens during the Arab Spring of 2011 and features all the trappings of Twenty-First technology. There are plenty of twists and turns in the plot, and high stakes and suspense are created and maintained: but the series and the story itself are not without their problems. There has been a lot of talk about Tom Hiddleston possibly replacing Daniel Craig as the next James Bond, and in some ways The Night Manager has been viewed as his extended audition for the part. That is fair enough, since the story of The Night Manager is highly derivative of the 1989 James Bond movie Licence to Kill, where Bond goes undercover to bring down a drugs cartel (which is the same in le Carré’s original novel) spurred on by a desire for revenge. The story also relies heavily on coincidence. It just so happens that four years after the events in Cairo in the opening half-hour, Pine is working in the same Swiss hotel that Roper checks into. Pine’s motive for revenge is tenuous too. He’d only briefly known Sophie, and it stretches credulity that he’d risk his life to avenge an acquaintance, especially several years after the event. The series is not short of corny dialogue, and poor Aure Atika as Sophie has the lion’s share of it. The other major problem lies in some of the performances. Olivia Coleman is acceptable but one-note as Burr, the intelligence operative who recruits Pine. There’s a small part for the always-unconvincing Neil Morrissey. Most fundamentally though, Hiddleston misjudges aspects of his performance. There is concern amongst British and American intelligence that Pine has been turned – seduced into Roper’s glamorous lifestyle – and is playing both sides, passing false information back to them. Alas, Hiddleston never allows the viewer to entertain even the possibility that he has been corrupted. He endlessly recycles a pained expression every time he disapproves of Roper’s actions: even when Roper can see him. This is both misjudged in terms of conviction as well as a wasted opportunity to create an even more memorable character who keeps the audience guessing about his motives and loyalties. Instead, Hiddleston’s Jonathan Pine is rather bland and winsome. On the positive side, there is in Hugh Laurie’s Richard Roper a masterclass in ice-cool on-screen villainy. Since House MD, Laurie has had the parts and the material to persuade viewing audiences that he is one of the most talented actors of his generation, and his deliciously seductive Roper further reinforces his credentials (the modest Laurie would make no such claims for himself – but we wouldn’t hesitate to). Tom Hollander is also a lot of fun as Roper’s camp and bitchy friend and colleague, Corky. When Laurie and Hollander share the screen together, The Night Manager is at its best. Elizabeth Debicki is also excellent as Roper’s girlfriend Jed. Her transition from arrogant airhead to vulnerable young woman is a compelling journey to follow. The problems with the story and some of the performances don’t wholly undermine the effectiveness of The Night Manager, and it still remains a series that deserves attention since it’s all directed with elan. It just isn’t the classic that it’s been made out to be. Revisit the original 1979 Tinker Tailor Soldier Spy for the best le Carré TV adaptation to date. There aren’t many extras, but it’s worth seeing the erudite Laurie talking about playing such an attractively ruthless character. Plot elements that are contrived and stretch credulity. Some poor or misjudged performances.